Countless vehicles were sold with copied VINs from other cars with similar specifications. As a result, many buyers fell for this scam. To prevent this, use the Ohio free license plate lookup to show real vehicle information associated with an Ohio plate. You may also send a record request form to the Ohio Bureau of Motor Vehicles, the state’s official license plate provider, to get the car details you need. For inquiries, contact the agency at (844) 644-6268 or through any of the following means: chat, email, other numbers, or mail. Requirements for vehicle registration may vary by type. Please check which vehicle type applies to you. New residents and owners may register their vehicles at a BMV registration office near their residence. In addition, a state-approved car insurance is required to drive a vehicle in Ohio. If you owned a car under age 26 and you are a resident of any of the following counties: Cuyahoga, Geauga, Lake, Lorain, Medina, Portage, and Summit, your car needs to undergo vehicle testing every two years. In general, the Ohio Bureau of Motor Vehicles offers license plates with three letters and four numbers for passenger cars. Each car is given two plates intended for display on its front and rear. Request a replacement/duplicate for your lost or mutilated plate by filling out the application form. It may take four weeks to process your request. See the General Information page for more information about personalized/specialized license plates. A request to transfer a plate can be done by filling out the request form. Follow the instructions correctly to process your request. Each plate transfer between cars costs $4.50. For title applicants, they must complete the application form and follow the instructions written on it. They must also comply with the requirements and process their request at an Ohio title office. Be aware that new cars have slightly different requirements from used ones. During the process, applicants must prepare their payment for the fees and taxes. Submission of late application is chargeable by late fees. If a vehicle is owned by more than two persons, an authorized Power of Attorney should be presented if the other owner(s) is absent during the titling process. In addition, the Social Security Numbers of owners should be presented at the office where the title application is being held. If a car has an active lien, it should also be indicated on the title. For newly purchased used vehicles, the seller must declare his or her intent of selling the vehicle on the title’s back. The seller must also disclose the important details of the agreement, such as the latest odometer reading and the date of sale. The applicant should notarize the document before submitting it. Make sure that the details in the title are correct. Removing or changing parts of the title may render the request invalid. Visit the Ohio Vehicle Titles Page to know more about the title processes in the state. Buying a used car in Ohio? Don’t make a costly mistake. 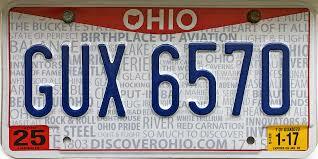 Run a Free License Plate Lookup for your Ohio-registered vehicle! Run a Free Ohio License Plate Lookup to uncover the full-story of your Ohio-registered vehicle.